The Bassline is a monophonic lead synthesizer loosely modelled after the legendary Roland TB-303. It consists of a single oscillator(2 waveforms) running through an envelope-modulated resonant filter, with LFO and Distortion effect. The bassline tutorial video shows how it works. Machine label: This is used to identify this machine in various places throughout the app. Its value can be changed via a long-press action (label changes color to indicate a successful touch). Upon successful long-press, a keyboard offering you to rename the machine will appear. Use this to identify a machine in a rack configuration where there might be more than one instance of the same machine. Preset LCD: This display shows the name of the last loaded preset and is used to load presets. A preset is a saved file that contains the positions of all knobs and controls. To load a preset, touch the preset LCD. This will bring up a File Browser with a list of saved presets to choose from. Save Preset button: This button allows you to save your own presets to disk for use later. Pressing this button will bring up a keyboard allowing you to name your preset. Presets are stored on the external storage in /caustic/presets/bassline. Pulse Width knob: When the waveform selector(3) is on square wave, this knob will control the duty cycle of the square wave. From 1% to 50%. Note: this control has no effect on the sawtooth waveform. Tune knob: Frequency tuning for the oscillator, in semitones. +1/-1 octave. Cutoff knob: Sets the frequency at which the filter starts to cut. Resonance knob: Sets the amount of resonance produced by the filter. Resonance is defined by small peaks at harmonic frequencies to the cutoff frequency. Envelope Modulation knob: Controls the amount of filter change during each note's lifetime. Decay knob: Controls the lifetime of each note. Accent knob: Controls the volume added to notes with the Accent(15) modifier. Output Volume knob: The final output volume of the bassline. Output VU meter: Indicates the level at which the bassline is outputing signal. If this reaches RED, then the bassline will output distorted sound. LFO Rate knob The speed at which the LFO modifies its target value. LFO Depth knob: The amount of modification the LFO apply to its target value. LFO Phase knob: Sets the timing for the sine wave used to modulate the LFO target. This is a offset sync value relative to the song's tempo. Distortion Pre gain knob: Pre-amplification used to send signal past the chosen program's threshold. Distortion Amount knob: The amount of distortion applied to signal above the threshold. Distortion Post gain knob Post-amplification used to compensate the distortion algorithm's output volume. Mute/Solo buttons: These buttons link to the ones in the mixer and are used to cut out this machine from the final mix or listen to only this machine. Legacy glide button: When pressed, this button controls the glide mode of the bassline synth. Legacy mode doesn' use overlapping notes to determine glide time and is mostly offered for legacy song support. 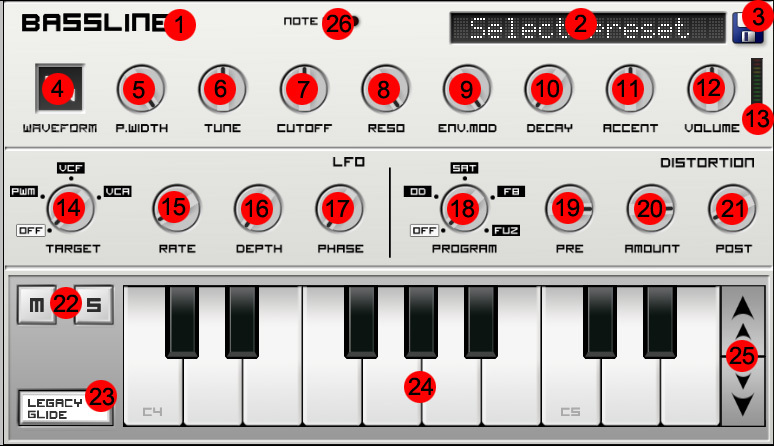 Preview Keyboard: This keyboard is used to play notes to help when designing sounds with the bassline. Octave buttons: Raises or lowers the octave of the Preview Keyboard. Note On LED: This LED lights up whenever a note is triggered.